Children's Book Week is right around the corner, which will give readers plenty of opportunity to look forward to a new hero hitting shelves. David Gallaher and Steve Ellis are bringing their own creation to the table, teaming up with publisher Papercutz to bring their webcomic The Only Living Boy to bookstores and libraries. The publisher has announced a multi-volume deal with Gallaher and Ellis’ Bottled Lightning Studio, brokered by Dara Hyde at the Hill Nadell Literary Agency, that will see the webcomic collected into a series of paperback and hardcover volumes beginning in March 2016. Publishing of the print collections will begin with a 72 page first volume entitled “Prisoners of the Patchwork Planet” set to arrive in March 2016. Plans call for subsequent books to be released on a regular schedule with the entire story eventually collected in six volumes. The Only Living Boy tells the story of 12-year old Erik Farrell, who runs away from home only to find himself without his memory, stranded on a patchwork planet with danger lurking around every corner. Every day is a struggle to survive. Erik quickly allies himself with Morgan, a mermaid warrior and Thea, a teenage princess from a mysterious insect race. He'll need their help to escape the Dreaded Lord Baalikar and the evil Doctor Once and maybe, one day, find his way back home. The Only Living Boy Vol. 1: Prisoners of the Patchwork Planet will be available in bookstores and comic book stores across the United States and Canada on March 8th, 2016. Full press release below. NEW YORK, NY (May 5, 2015): As Children’s Book Week 2015 kicks off its celebration of beloved children’s characters, young readers can look forward to a new hero hitting their shelves early next year. David Gallaher and Steve Ellis, the award-winning creative team behind digital hits HIGH MOON and BOX 13 are teaming up with industry-leading kids graphic novel publisher Papercutz to bring their webcomic sensation THE ONLY LIVING BOY to bookstores and libraries everywhere. The publisher has announced a multi-volume deal with Gallaher and Ellis’ Bottled Lightning Studio, brokered by Dara Hyde at the Hill Nadell Literary Agency, that will see the webcomic collected into a series of paperback and hardcover volumes beginning in March 2016. Publishing of the print collections will begin with a 72 page first volume entitled “Prisoners of the Patchwork Planet” set to arrive in March 2016. Plans call for subsequent books to be released on a regular schedule with the entire story eventually collected in six volumes. 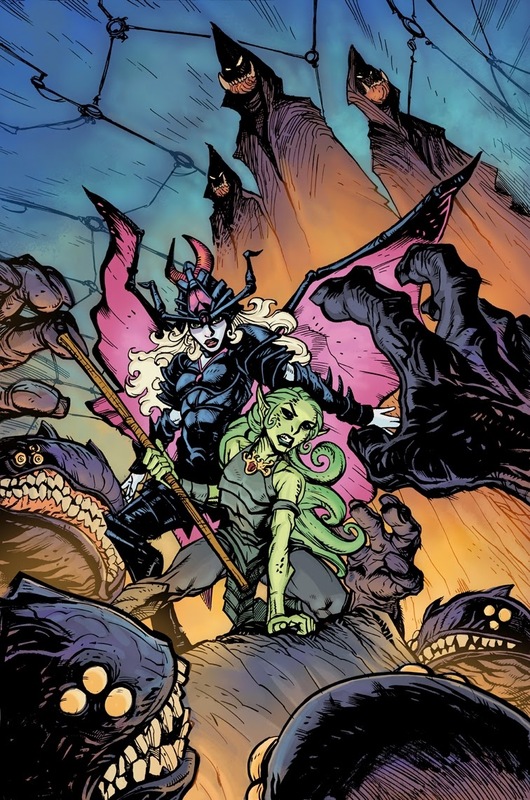 THE ONLY LIVING BOY VOL. 1: “Prisoners of the Patchwork Planet” will be available in bookstores and comic book stores across the United States and Canada on March 8th, 2016. To find a comic shop near you go to http://www.comicshoplocator.com/ or dial 1-888-COMIC BOOK. ABOUT PAPERCUTZ: At Papercutz, we’re all about publishing great graphic novels for all ages. Papercutz graphic novels for kids, tweens, and teens include a wide range of genres, including humor, action adventure, mystery, horror, and favorite characters. Papercutz is proud to be the only publisher exclusively dedicated to children’s graphic novels. We work every day to introduce young readers to the imaginative wonders waiting to be discovered in comics.To find out more visit http://www.papercutz.com. MEDIA CONTACT FOR PAPERCUTZ: Sven Larsen at larsen@papercutz.com or 646-559-4681. ABOUT BOTTLED LIGHTNING STUDIO: David Gallaher & Steve Ellis have pioneered the landscape of digital comics, tamed werewolves, and fought vast conspiracies – and that’s just the beginning! Bottled Lightning is their undertaking, sparking life and excitement into stories for themselves and a broad range of brands, including The Walking Dead, Green Lantern, Breaking Bad, Dungeons & Dragons, MTV, and the New York City Police Department. Their featured projects include HIGH MOON, THE ONLY LIVING BOY, and BOX 13.You can visit them online at bottled-lightning.com.